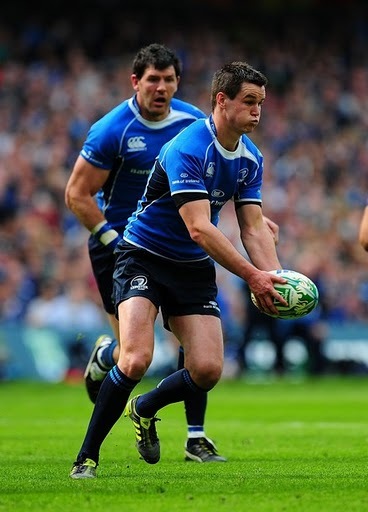 Leinster fly half Jonny Sexton action against Toulouse in Dublin on Saturday. Leinster are just 80 minutes away from a second Heineken Cup crown in two years after a mesmerizing semifinal win over reigning champions Toulouse at the Aviva Stadium on Saturday. Brian O’Driscoll sin-binned just before the break. Sexton kicked 22 crucial points for the winners. They will now meet Northampton in the Cardiff final at the end of the month with Leinster likely to be favorites to win their second European crown, two years after the Edinburgh win over Leicester. Man of the match Heaslip has denied that revenge for last year’s semifinal defeat away to Toulouse had any bearing on Saturday’s performance. “It wasn’t a case of it being a revenge mission for us, not at all,” claimed Heaslip. “We’ve got our goal set on winning the competition and Toulouse just happened to be the team in the semifinal. Leinster had to work hard to keep the European kingpins at bay in a match that had everything you could ask for in a top class rugby fixture. “It was certainly tiring out there, it was a fast game and the intensity was high,” added Heaslip. “We have a lot of leaders in that team and that showed in the final minutes. Leinster flanker Sean O’Brien has escaped any punishment for landing a punch on opposite number Yannick Nyanga after the Toulouse forward had obstructed him in the run-up to a Louis Picamoles’ try. IRISHMAN Conor O’Shea came home to torture Munster as the Reds lost only their second ever European fixture to Harlequins in the Amlin Cup semifinal on Saturday. Harlequins coach O’Shea masterminded a 20-12 win that left the home crowd and opposite number Tony McGahan in shock. “We won the toss and our captain Chris Robshaw came up to me and said that he wanted to play into the wind because he wanted us to play our game,” said O’Shea. “The minute he said that I knew we would be fine in terms of bringing our game to Thomond. I’m delighted for the players because of the work that they have put in. The Londoners always looked the better side on a day when Munster were 14-0 down after 35 minutes and just never hit form. “The way that we played didn’t give us any opportunity whatsoever to get a result,” admitted McGahan. CELTIC manager Neil Lennon described Beram Kayal as world class after his stunning goal in the 4-1 home win over Dundee United, and Irish striker Anthony Stokes was quick to agree. The Israeli international was on target as Celtic moved within one point of league leaders Rangers but with a game in hand as the season comes to a climax. Gary Hooper, before the break, Kris Commons and substitute Daryl Murphy also scored for the Hoops while United substitute Johnny Russell grabbed a consolation. Asked about Kayal’s goal and his qualities as player, Stokes remarked, “Beram is a quiet lad but out on the pitch he looks like a man possessed at times. “He is a great lad, great to have around the place and he has a bit of banter as well. He was outstanding against United. They had an extra man in midfield but you wouldn’t have thought it with the way Beram and Scott Brown got round the pitch. Lennon was also quick to praise the Israeli midfielder after the emphatic win on Sunday. “I thought he was world class,” said Lennon. “I thought he and Scott Brown were magnificent from start to finish and had to cope with three in there. Celtic have four games left to secure the title, and Lennon is happy with the way his team are shaping up after Rangers won 5-0 at Motherwell on Saturday. Lennon has also defended his behavior at the end of the recent Old Firm draw with Rangers when he cupped his ears as abuse rained down from the Ibrox stands. “My behavior was exemplary on Sunday during the game. No spats with anyone,” insisted Lennon. “I walked on the pitch like always after away games, congratulated my players and the fans, which I’m entitled to do. “Some people stayed behind to let me know what they thought of me and I just cupped my ear to say I’m not listening. It was reported the police spoke to me. They didn’t. There were two policeman at the end of the tunnel and they congratulated me as I came off. Meanwhile, Celtic left-back Emilio Izaguirre has been named Scotland’s Player of the Year by his fellow professionals. Izaguirre has been linked with Manchester United and Liverpool, but Celtic hope to offer new contracts to the defender and midfielder Kayal to fight off interest from England. SHAY Given has told Giovanni Trapattoni to count him in for the European Championship clash with Macedonia in June. Irish goalkeeping coach Alan Kelly has confirmed that Given will be fit in time for the Carling Nations Cup games at the end of May and the tricky Euro qualifier in Skopje at the start of June. Given is back in full training with Manchester City after undergoing a second shoulder operation in February and expects to be on the bench for the FA Cup final against Stoke. The Donegal native will be named in the Ireland squad for the end of season games. “Shay sent a message this week to tell us that he is back in full training and doing very well,” said Kelly. “He is fighting fit once again and looking forward to getting back on the field with City and with Ireland. SHAMROCK Rovers remain three points clear at the top of the Airtricity League Premier Division after Monday’s 1-1 draw with Dundalk at Oriel Park. Sligo Rovers had the best win of the day as they beat visitors Derry 3-0 in a game that saw four players sent off. Bohs secured a late equalizer in the 1-1 draw with Bray, St. Pat’s thumped Galway 5-2 and UCD beat Drogheda 2-1. THE FAI are now considering a friendly and a training camp in Italy in June as an alternative to the U.S. tour to New York and Philadelphia which is now all but dead in the water . . .
FORMER Irish international defender David O’Leary has been sacked as manager of Al-Ahli in the Middle-East.